With the legal enactment of planning permission as of November 2018, Steiner AG has been given the green light to proceed with the “Am Südhang” project in Brügg in the Bernese Seeland region. This project, developed by Steiner AG, comprises three freestanding new-build apartment blocks containing a total of 24 exclusive owner-occupied properties. Construction work is scheduled to start in 2019. 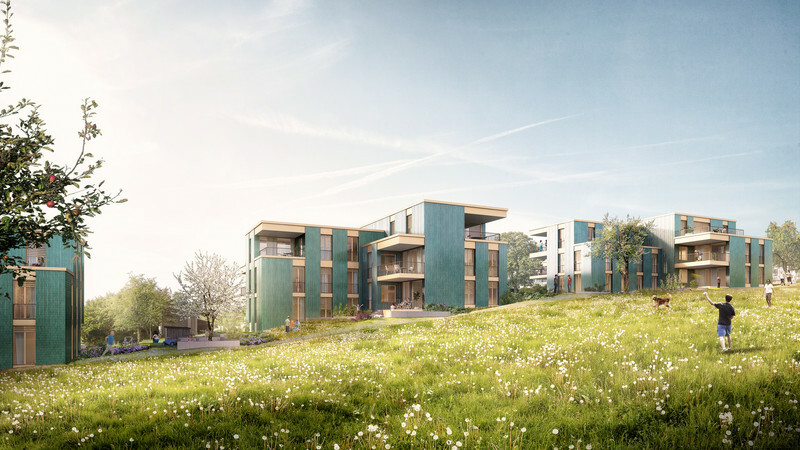 On 26 October 2018, Steiner AG received planning permission for the “Am Südhang” housing development in Brügg, which comprises 24 owner-occupied flats and a shared indoor car park. Since no objections to this meticulously planned project have been lodged, the planning permission takes legal force this month. The planning process for this attractive residential construction project in an idyllic setting can therefore move into the next phase. 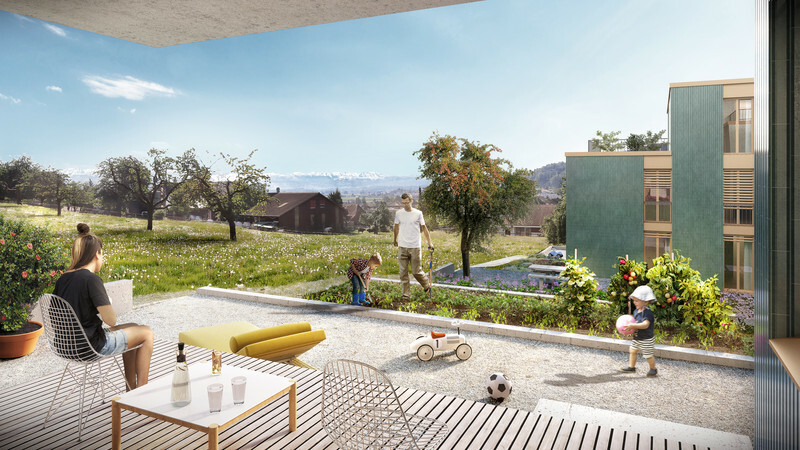 The future residents of the “Am Südhang” housing development in Brügg will enjoy a charming hillside setting with views of the Alps, the Swiss central plateau and the surrounding farmland while remaining close to their daily needs. Inspired by their exceptional location, the 24 owner-occupied properties in the three apartment blocks effortlessly achieve a balance between rural and urban. Each block combines three elements grouped around a central concourse. Each individual flat has its own separate wing, thus creating an ample sense of visual and physical space. The centre of each 3.5 to 5.5-room flat features an open living/dining area which blends seamlessly with the surrounding rooms, while expansive glass fronts and floor-to-ceiling sliding doors provide views in three directions. Located to the south of Biel/Bienne on the Nidau-Büren Canal, the municipality of Brügg casually combines the benefits of urban and rural life, and retains a village feel despite its urban attributes. From the modern housing development “Am Südhang”, you can reach the A6 motorway serving Biel/Bienne, Bern and Neuchâtel in just a few minutes. Travel time to the centre of Biel/Bienne is thus around ten minutes. The site also has good public transport connections (bus and S-Bahn rail routes). In this family-friendly neighbourhood, you can walk to kindergartens, primary and secondary schools as well as various shopping facilities in a few minutes. Marketing activities for the exclusive owner-occupied flats in the Bernese Seeland region are already underway. The sale of the properties – managed by the real estate marketing department at Steiner AG – has successfully begun and the first flats have already been reserved. Steiner AG, one of the leading project developers and general/total contractors (GC/TC) in Switzerland, offers comprehensive services in the fields of new construction, refurbishment and real estate development. The company, which was established in 1915, has constructed more than 1,500 residential projects, 540 commercial properties, 45 hotels and 200 infrastructure facilities such as universities, schools, hospitals, retirement homes and prisons. Steiner AG has its headquarters in Zurich and is represented by branches in Basel, Berne, Geneva, Tolochenaz and Lucerne. The "Am Südhang" Project, developed by Steiner AG, comprises three freestanding new-build apartment blocks.